The manner in which a hard disk drive fails will determine how it is to be repaired and ultimately, how its data will be recovered. There are many different methods of hard drive repair – an external hard drive that has been dropped and now clicks requires a completely different method of repair than a hard drive that has a firmware failure, for example. The hard drive repair and data recovery process is an exacting and often difficult one that should only be attempted by a professional data recovery company like Data Clinic Ltd.
Hard drive repair and recovery IS NOT the domain of high street PC shops who lack the knowledge, skills and equipment to perform data recovery. Unfortunately, this fact often doesn’t stop them from trying it, frequently with disastrous results. Do Not use a High Street PC shop to repair your hard drive or recover your data. Data recovery is the process of recovering data from storage media that, for one reason or another, is no longer accessible by normal means. This may be because the storage media to which the data was written (eg. a hard disk drive) has become damaged in some way: it may be a hard disk that now clicks when powered on, or it may be a server with several broken hard drives that can no longer be accessed. In other cases there may be nothing wrong with the media, but the data may have become lost due to it being accidentally deleted or overwritten. Most of the time, data is held on hard disk drives. 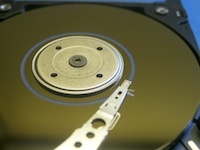 Hard disk drives can break in a variety of ways and a data recovery service can be used on any type of computer system that uses computer storage media eg. a RAID server in a business, a desktop machine running Windows that holds company payroll, an Apple Mac system in a graphic designers office, an external hard drive carried around in a businessman’s briefcase or student’s backpack, or the memory cards of a professional photographer. When a hard disk failure occurs on a system it can be for a variety of reasons, and it’s important that the fault is diagnosed properly and correctly as this dictates the steps necessary in order to successfully recover the data. Electronic Failure – Typically caused by a power surge, for example, plugging the wrong mains supply into an external hard drive. Mechanical Failure – This relates to physical problems on the hard drive – for example, a head failure resulting from the drive being dropped or receiving a knock. The clearest indication that a hard disk drive has a head fault is a knocking or ticking noise when the drive is powered on – You can listen to an example of a drive with a head fault starting up here. A clean room is required with all types of mechanical fault as the drive has to be opened. Logical Corruption – This refers to problems with the actual data rather than the storage media it is held on. For example, data has been deleted or operating systems re-installed etc. At times a combination of these four is possible and the chances of recovering data depend upon the extent of the damage that has occurred. Click here for a more in-depth explanation of these failures. Few companies have invested as much time and effort in developing their data recovery abilities as DataClinic. Since 2002 we have been providing professional and specialist data recovery services to businesses, institutions and individuals across the UK and we are extremely proud of the prominence we have achieved within this business sector. In conjunction with Manchester University, the Italian hardware company GCubic and the DTI we have uniquely developed a whole range of different techniques at our disposal to help us to recover data from every modern piece of technology in current circulation. Our progress in this investment has resulted in us being recognised as an industry leader in data recovery; it even gets us business from some of our competitors who realise that their expertise is not quite a match for our broader range of techniques. We are happy to discuss any storage media or hard disk problem you may have with you and we will attempt to diagnose the disk problem on the phone so we can recommend the recovery options that are available to you. We have a number of local branches throughout the UK – view our locations, or you can call in or use our free collection service that collects directly from your door. This collection service is available throughout the UK. It is entirely understandable that the prospect of losing potentially valuable data can be very upsetting and we fully appreciate that you will want to know the prospects that exist to retrieve your data. There are many different causes of hard disk failure and our experienced staff will be able to successfully identify the specific problem very quickly and tell you the prospects of recovering your data.